This guide gives an overview on what permissions are available under the 'Supervisor' access level. Before you get started, you'll need to make sure that you have accepted your invitation to Deputy and that you are logged in as a Supervisor. When you first log in, you will land on the Deputy organisation page. The Deputy organisation page lists the businesses you are linked to in Deputy. Please click the name of your organisation, which will take you to your Home page. You can find an explanation of each tab below. 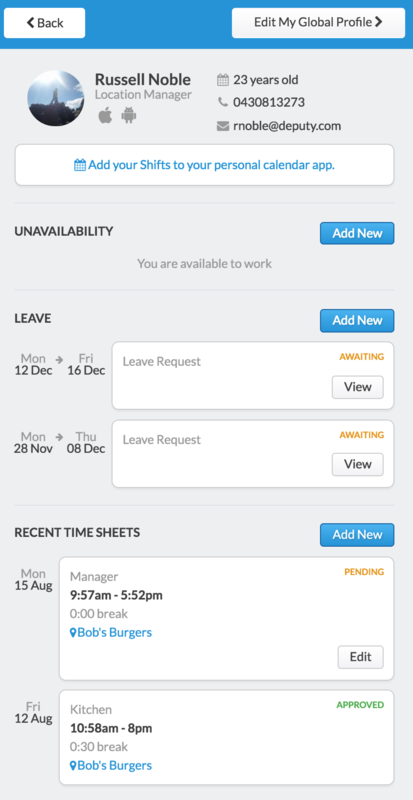 In the Me tab, you will find a general overview of your weekly shifts and previous timesheets. From this page, you can also view future shifts or previous timesheets via the date range selector. If you have a shift for the day, you can Start and End your shift in the top right-hand corner. From here, you can also Request Time Off, which is accessible by clicking the 'Request Time Off' button. The News Feed is the main communications hub between the employers and employees. You can post messages to locations, or even specific people. News Feed posts can have files attached to them (image and document files) if you would like to add clarification to the post. You can also attach 'Confirmation' notices to posts. These posts have a button that employees can click so that you can see who has read the post. 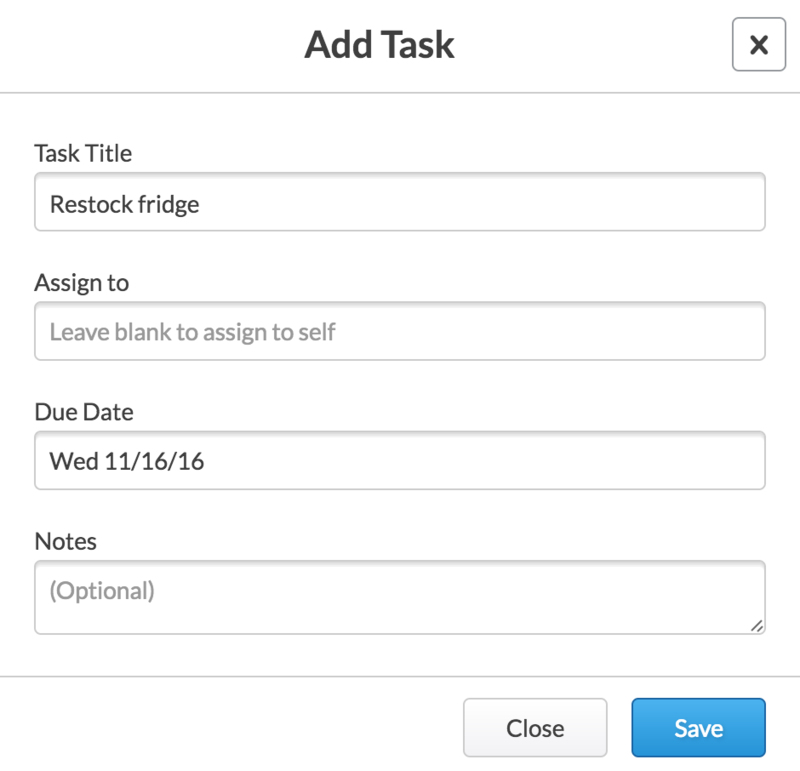 The Deputy tasks page allows you to assign tasks to other employees and team members. To assign tasks, navigate to the Tasks page and click 'Add Task' in the top right-hand corner. In the pop-up box, you can enter the details of the task, including the name, who to assign it to, a due date, and any notes that are relevant to the task. This page will list your locations. From here, you can see the location address, as well as edit any settings pertaining to that location via the 'Edit Settings' button. This page displays all of the employees at this business. 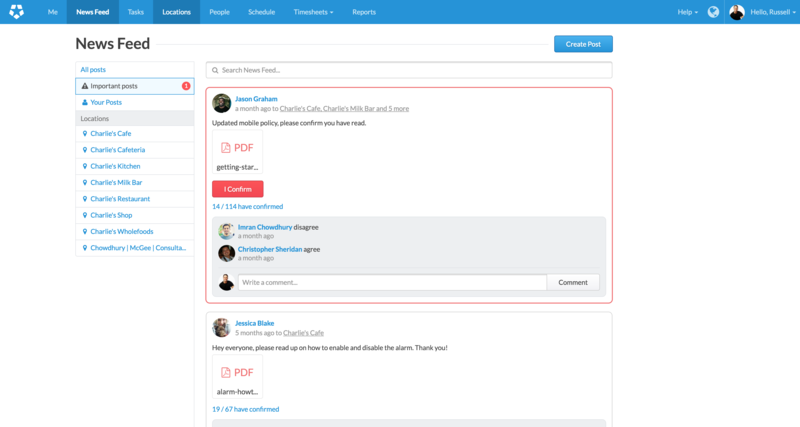 You can add additional employees via the blue 'Add People' button in the top right-hand corner. 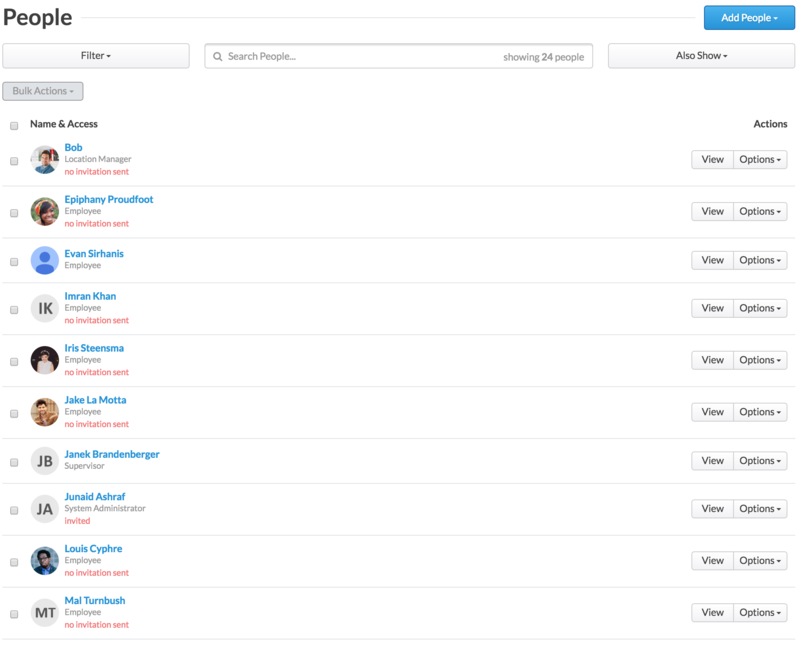 From here, you can also view and edit employee profiles on this page, send invites, and discard employees. This page is the main scheduling hub. From this page you can organise your roster, see your wages vs. sales, and see a weekly overview. For information on scheduling your staff, please click here. Once your employees are scheduled, they will need to clock on and off to establish their attendance. There are three ways to clock on. These are the smartphone app, the Deputy Kiosk, and the website, which must be enabled. Staff members clocking on/off will automatically generate timesheets. Once generated they must be approved, either manually or automatically, for the staff to be paid. As a Supervisor, you are able to Approve Timesheets, but only for team members who are under the 'Employees' access level. To approve a timesheet, please click one of your employees on the list to the left. The page will then display a list of unapproved timesheets for each of the employee's shifts. You can edit the beginning, end and break, as well as make a journal entry for the shift. You may also import the details directly from the roster, overriding the shift, by clicking "Import Rostered Details". After you are finished with the timesheet, please click "Approve", below the fields. Please be aware that your employees may also edit their timesheets, pending approval. Your Profile can be accessed by clicking "Profile" at the top right corner of your screen. The Profile screen displays a number of important details. At the top, you can see your access level and contact details (which only you may edit). 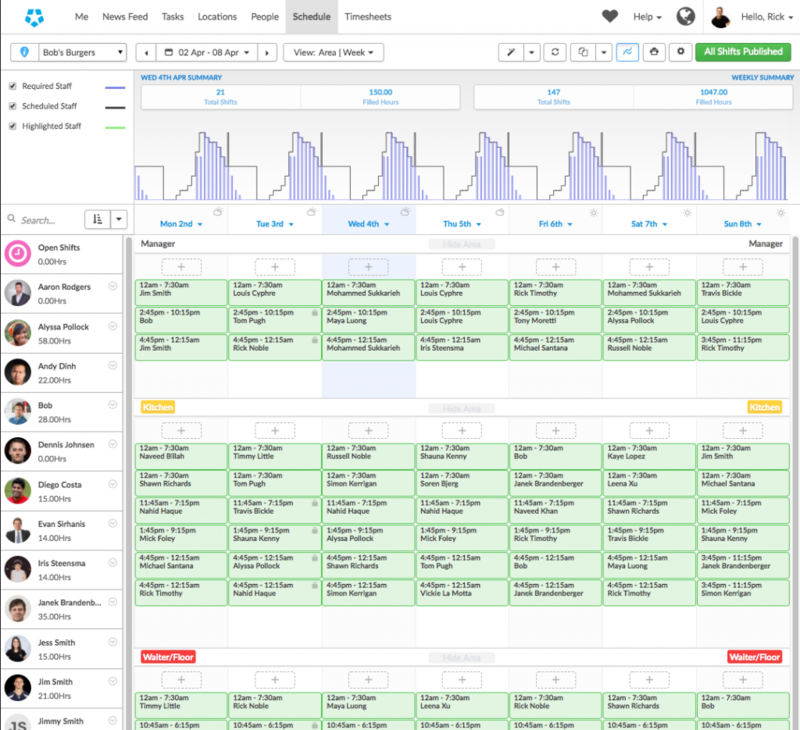 Beneath, you can see your next three upcoming shifts and your last three timesheets. To view a list of your timesheets in chronological order, please click "View All", just above your most recent timesheet. Once the list appears, please scroll down to see more. 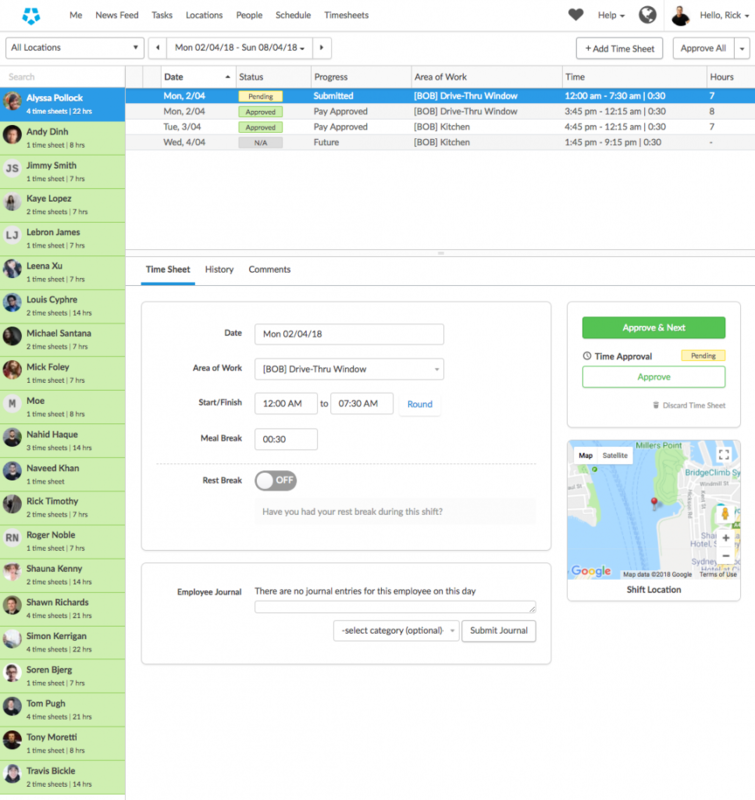 Below your timesheets, you can see your unavailability and leave. Unavailability is an informal request for time off, for example for getting your car serviced, or a doctor's appointment. Leave is a more formal application for time off, such as annual leave, which requires approval. You may add new unavailability and leave from just above their respective fields. At the very top of your profile, you will see a button that reads "Edit My Global Profile". Clicking this will take you to your Global Profile, which contains settings for your Deputy account. 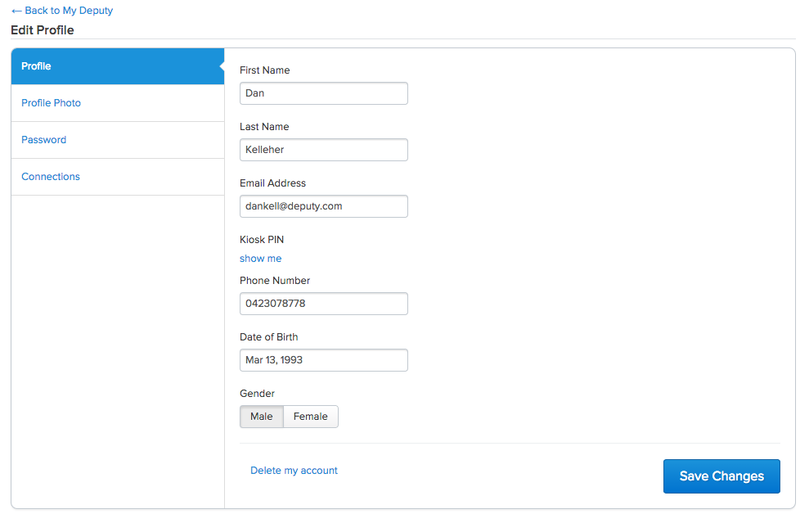 From the Global Profile, you can edit your personal details, Kiosk PIN (click "Show Me"), login password and profile photo. You may also connect to Google and Facebook, which will allow you to sign in with the same email that you used to register with them.